After a good first night's sleep, we woke, and headed down to the hotel's breakfast room. Breakfast is included in the room rate, always a desirable amenity. Standard European fare, but very well done--eggs, yogurt, assorted island fruits, cereals, cheeses, fresh juice, croissants, pain-au-chocolat, lox, and other goodies. Back to the room, pack for the day. 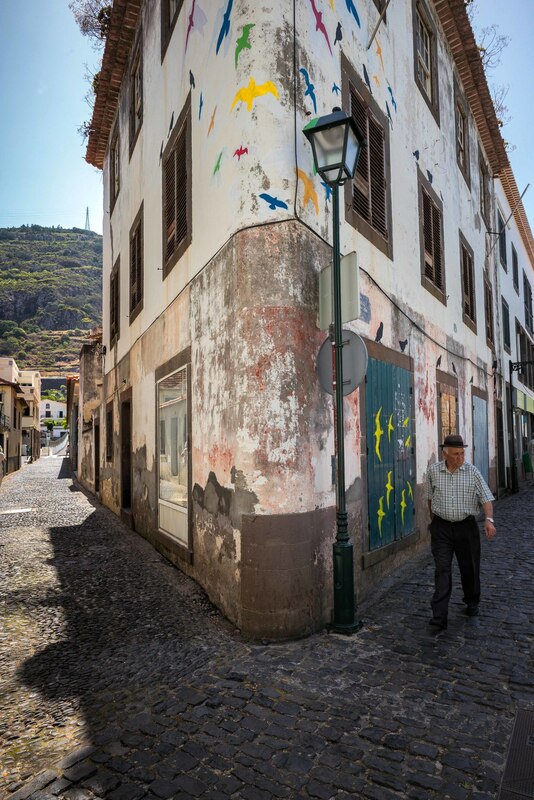 At 10:00AM, Esmeraldo Caldeira, a life-long native, arrived to pick us up for our day-long tour of Maderia's northern mountains and southern coastline. We had thought about renting a car, but after just a few minutes of hair-raising turns, steep inclines, and single lane roads, we were glad we opted for an experienced guide. It was clear that Esmeraldo was relying heavily on the mirrors strategically positioned at street intersections and turns to make sure that there was no oncoming traffic before proceeding. It was beautiful day, but there was a fair amount of haze in the air due to the heat. First stop: Pico do Ariero, where we were above the tree line, providing spectacular views of the Atlantic and the island. Interestingly, the air traffic control radar site that monitors all traffic between Europe and Africa sits atop this peak. I was a little disappointed with the vie, at least from a photographic viewpoint. Normally, you walk the peak in sporadic cloud cover hiding and revealing views as you walk. Due to the unseasonably hot weather, there were no clouds. Next we continued north toward Ribeiro Frio, where we began a short levada walk that is referred to as the Balcões walk (it ends with a view over a valley, hence a balcony). 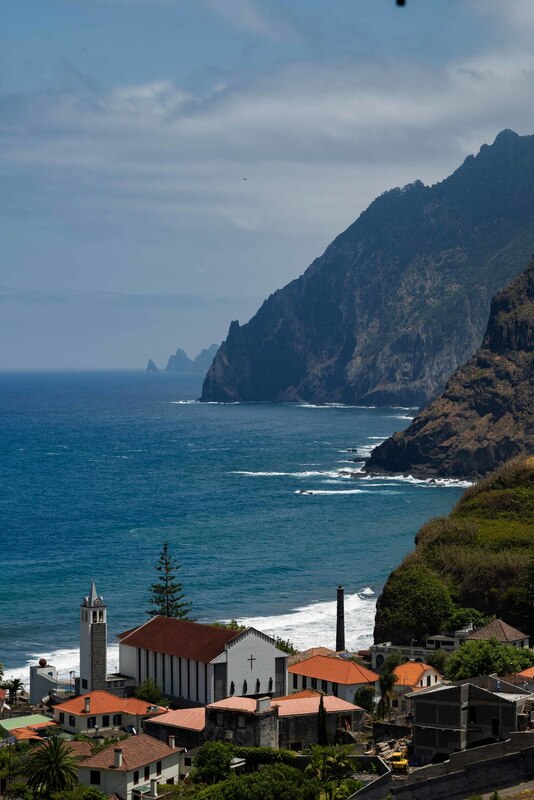 The island has some 2,100 kilometers of levadas, which are man-made (read that as slaves suspended from ropes) canals that transport water throughout Madeira. The island's water supply is sourced entirely to the evaporation from cloud cover. This particular walk was very tame, but some of walks go on for miles over rough terrain, with steep drops on both sides of the levada. As the day proceeded, we saw terraced farmland, the town of Porta da Cruz on the northerly side of the island (very picturesque from our elevated vantage point), and the triangle-shaped houses in Santana, also on the north side of the island. We finished up in the town of Machinco, visiting a beautiful church, before heading back to Funchal. We normally have one dinner at the hotel. Tonight was the night. We both had the Madeira fresh tuna with a bed of vegetables, and a salad. The vegetables and salad included cucumber, zucchini, small tomatoes, red and green peppers, and cipollini onions. For dessert we split an orange Crème Brulée, with orange cake and local berries. Delicious. Since we were in Madeira, we split a bottle of dry white Madeira wine. After dinner, we relaxed in our room, with the Democratic Convention in playing in the background. Even overseas, most of the speeches are boring, so I could devote my full attention to editing photographs.